Another entry in Old Time Blues’ continuing series on the territory jazz bands that once dotted the United States, we look upon the obscure history of Henny Hendrickson’s Louisville Serenaders. Details about the Louisville Serenaders are scarce, it would appear that the band made little mark on history. They were led by reed man Clarence “Henny” Hendrickson. In spite of their name, they did not hail from the vicinity of Louisville, Kentucky, but rather toured the Delaware, Pennsylvania, and New Jersey area. The same stunt was pulled by Johnny Hamp’s Kentucky Serenaders, who also hailed from Pennsylvania. Perhaps the Louisville Serenaders chose their name in an attempt to emulate the successful Victor recording orchestra (purely speculation). In any event, they had three sessions for the RCA Victor Company in Camden, New Jersey in 1930 and ’31, yielding a total of fourteen sides, eight of which were released. Half of those were issued on the Victor label, while the other half appeared on their short-lived budget label Timely Tunes. No sides from their first session on July 21, 1930 were issued, while all of those recorded at their second and third sessions, on June 10 and 17, 1931, were. Among those sides are a memorable rendition of “I Ain’t Got Nobody” and a peppy version of Harold Arlen’s “Buffalo Rhythm”. I can find no information concerning the life and times of bandleader Clarence “Henny” Hendrickson. Timely Tunes C-1585 was recorded on June 10, 1931 at Victor’s church building studio near their Camden, New Jersey headquarters. Among the Louisville Serenaders are Herb Facemyer and an unknown player on trumpets, Johnny Lingo on trombone, Clarence “Henny” Hendrickson on clarinet, soprano sax, and alto sax, Don Shook on alto sax, Eddie Friebel on tenor sax, Bill Wallace on piano, Wyatt Haynes on banjo and guitar, Art Maxwell on tuba and and unknown drummer. The trio that sings on both sides is made up of Facemyer, Maxwell, and Friebel. The first song which the Serenaders will serenade us with is Cliff Friend and Dave Dreyer’s “I ‘Wanna’ Sing About You”. 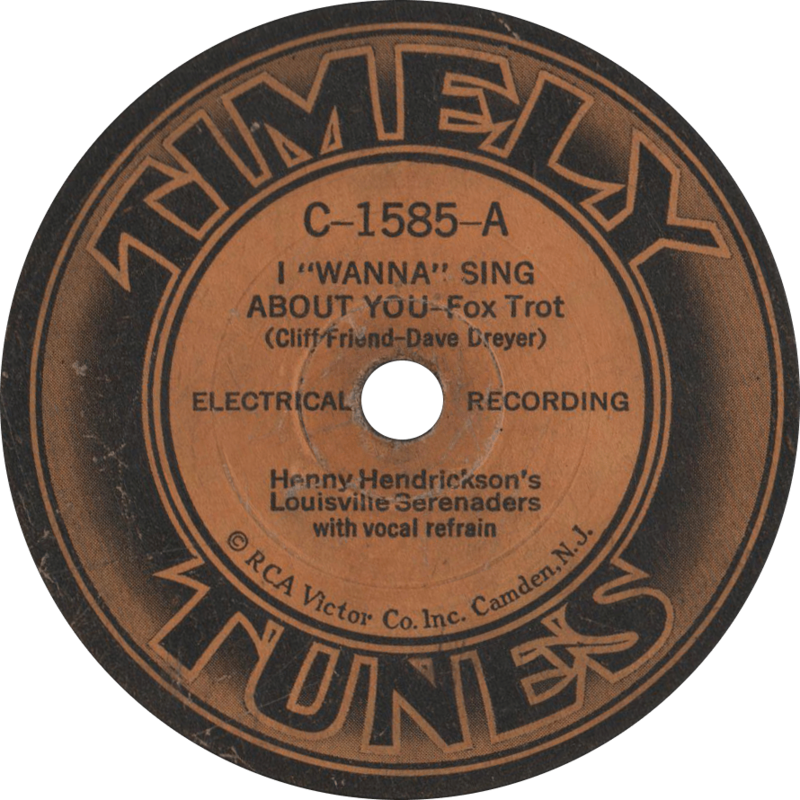 I “Wanna” Sing About You, recorded June 10, 1931 by Henny Hendrickson’s Louisville Serenaders. Next, they play a mighty fine rendition of the old classic “I Ain’t Got Nobody”. 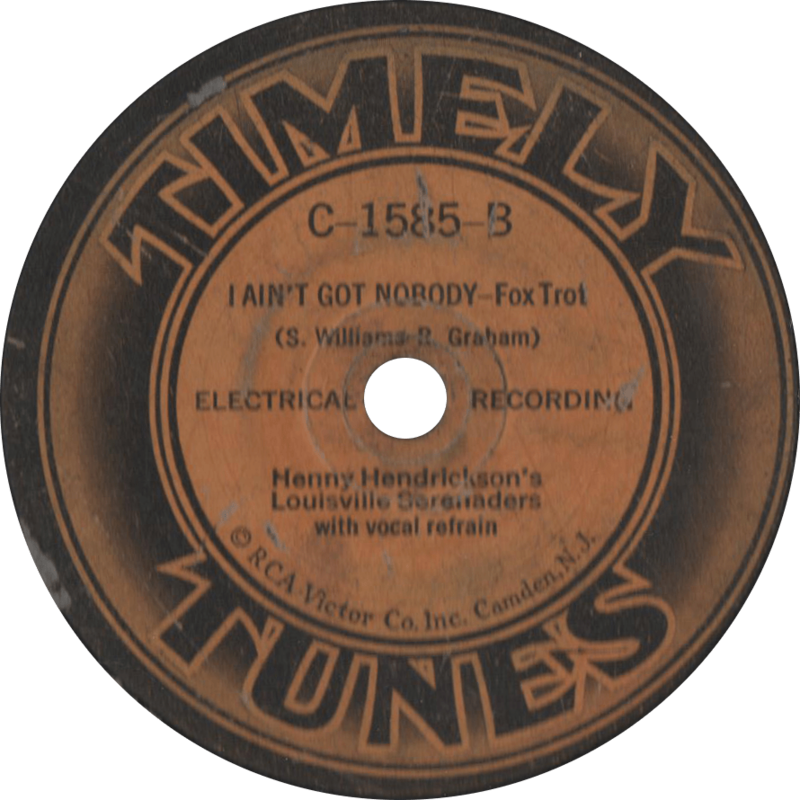 I Ain’t Got Nobody, recorded June 10, 1931 by Henny Hendrickson’s Louisville Serenaders. Yes, the Chief Big Buffalo Nickel, a mighty man in his day. Never once used sickle to clear the bushes away. He would go ’round from tent to tent, eat everything in sight. He loved a squaw, every one he saw. He loved a new one every night.